Taking a break from my movie goal for 2018 I found your weekly Netflix Pick. Troy: Fall of a City is a dramatized retelling of the ten year long Trojan War. The ancient world didn’t have much of a line between myth and fact. Fall of a City does an interesting dance to tell it’s story. Fall of a City focuses heavily on Paris. Paris (Louis Hunter) is the estranged son of Troy. During a chance contest with Hector (Tom Weston-Jones) Paris is discovered and brought back into the fold. Hector is skeptical on the trust given to Paris. Their sister is something of an oracle or seer. She has had bad premonitions about Paris since he was a baby. She, and the audience, see the events of the Trojan War coming. Paris and Hector travel to liaise with Menelaus (Jonas Armstrong). Menelaus is the king of Sparta, a formidable ally. Paris falls for Menelaus’s wife, Helen (Bella Dayne). At first the flirting feels like a slight against Menelaus. The two fall for each other in a real way. When Helen sneaks aboard the Trojan ship and flees with Paris Menelaus is furious at the insult. Agamemnon (Johnny Harris) has been itching to go to war with Troy. He seizes the opportunity as a perfect excuse to do so. These ancient stories are grounded in history. There is a lot of historical evidence that the Trojan War did happen. Some historians still believe it to be a story. The Trojan Horse appears to be nothing more than artistic license to make the story grander. It’s reasonable to believe that people like Hector, Paris, Menelaus, and Agamemnon could have existed. Was Achilles a real person? Impossible to say. It’s reasonable to assume that he wasn’t dipped in waters making him all but invincible. The Greek and Roman gods are an integral part of the cultures histories. As advanced as these civilizations were in their time there was a good for every last aspect of their life. Their gods are not untouchable beings, they walked amongst the mortals. In Troy: Fall of a City, the gods shoulder the blame for Paris and Helen’s affair as well as the whole conflict. Aphrodite (Lex King) more or less curses Paris so that he and Helen will fall in love. 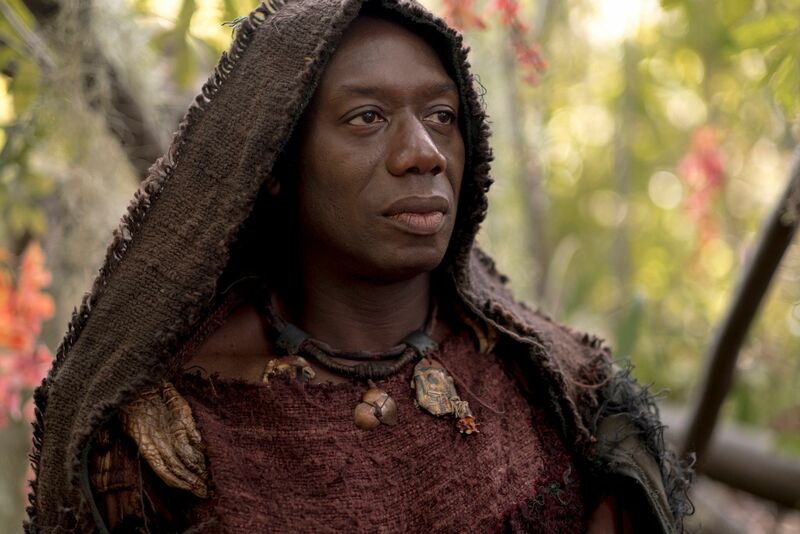 With different gods pulling the strings and Zues (Hakeem Kae-Kazim) not getting involved; mankind is left to tear itself apart. The Iliad, along with the other Greek Tragedies, have shaped pop culture. The heroes, the villains, the mysticism, and the fantasy. The story structures in these tales are still used in our modern entertainment. It seems more often than not these stories don’t get the respect they deserve. For every Wolfgang Petersen Troy (especially the director’s cut) there is a Rock led Hercules or even worse a Troy: The Odyssey. Troy: Fall of a City is a great effort that makes the story its own. The artistic license taken with the story and the inclusion of the gods make it an interesting blend. The battle scenes fall short, but Fall of a City is about the events, not brutality.